Need a Home Inspection in Edmonton? 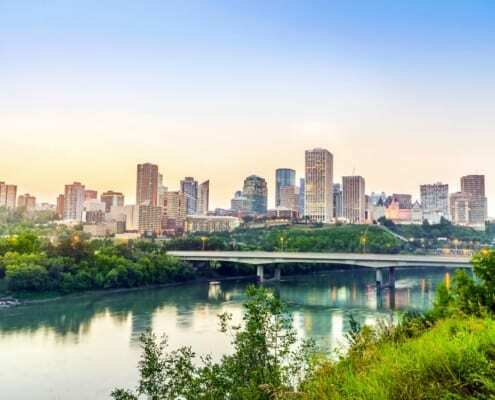 Edmonton is the capital city of Alberta, and it’s the second-largest city in Canada, with a population of 932,546 in the city proper, and more than 1.3 million people living in the Metropolitan Statistical Area (MSA). The city is quite diverse. Around 55% of the population are European, with minorities accounting for nearly 38% percent of the population, and a 6.4% Aboriginal population. As of the most recently-available census data, there were a total of 348,662 dwellings. The average household income per household is $103,856 CAD, according to the most recent estimates. The Edmonton area has been occupied by native peoples for millennia. However, the modern city traces its roots back to the 1700s, when Europeans established it as a trading post, and built Fort Edmonton on the north bank of the river in 1795. The city grew dramatically after 1885, when the Canadian Pacific Railway was built. In 1904, it had a population of just 8,350. Today, Edmonton is one of the largest, most major economic centers in all of Canada. The city has many different economic drivers and industries, with one of the most major industries being oil and gas production. The value of major Edmonton fossil fuel projects in the area has been estimated at nearly $58 billion, and it’s been a hub for the petrochemical industry for decades. In addition, Edmonton has a strong higher education system, and is also a center for scientific research and banking. Many banks, such as Canadian Western Bank, and ATB Financial are headquartered in the area. Post-secondary education is provided by Concordia University of Edmonton, MacEwan University, and University of Alberta, among many other private and public colleges. Transit is provided by Via Rail for inter-city rail, and the Edmonton Transit Service (ETS) operates a large fleet of buses. However, most transportation in the city is auto-based. The Edmonton International Airport is the main airport that serves the city, and is a main hub for passenger service to Europe, Mexico, the United States, and the Caribbean. The climate of Edmonton is quite cold and dry, and winter tends to last from November to March, with May-October being relatively mild. However, Edmonton is also one of Canada’s sunniest cities, receiving 2,299 hours of bright sunshine per year. Primarily, schooling in Edmonton is provided by Edmonton Public Schools, as well as the Edmonton Catholic School District, and the Francophone Greater North Central Francophone Education Region No. 2. There are also a large number of charter schools. If you’re interested in living in Edmonton, these resources related to the city may be helpful.